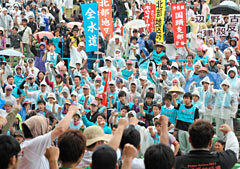 A peace march was staged on May 15, 2011, the date marking the 30th anniversary of Okinawa’s return to Japanese sovereignty. After the march, the participants held a protest rally demanding the “Protection of Peace and Daily Life in Okinawa” (hosted by the 5-15 Peace March Executive Committee and the Okinawa Peace Movement Center) in Ginowan City, where the Futenma Air Station is located. According to the organizers, about 3300 people participated in the rally held at an open-air theater in Ginowan Seaside Park. At the rally, it was decided to further strengthen protest movements against the construction of new military bases within Okinawa and against further armament, namely the relocation of Futenma Air Station to Henoko, Nago City, the integration of Futenma Air Station to Kadena Air Base, the construction of a new heliport in Higashi Village in Takae, and deployment of Self-Defense Force troops to Sakishima Islands. The peace march was staged on two courses on the main island of Okinawa in which the participants walked around Futenma Air Station with one more course on Ishigaki Island. The people marched chanting calls for the removal of U.S. military bases. They then adopted a resolution demanding that the Japanese government reallocate the budget for realignment of U.S. military forces in Japan to the reconstruction needed after the Great East Japan Earthquake. Following the earthquake, the organizers of the peace march and protest rally took into account the fact that peace organizations and labor organizations that usually took part in the peace march and protest rally were focusing on supporting victims of the areas stricken by the earthquake, so they scaled down schedule and scale from what was normally held over three days before and after the anniversary of Okinawa’s return to Japan. Although the organizers didn’t call for groups outside Okinawa to participate, about 800 people from such organizations voluntarily took part in the peace march and protest rally. Before the rally commenced, musician Acoustic-M sang a song calling for people to be united.